This Ohio Inmate Search page will help you locate inmates residing in a state institution or a county jail. To find inmates within an Ohio correctional facilities click to go to the Inmate Search Page. You will find a list of inmates with that name, their photo, inmate number, date of birth, status and their offense. Click the offender number and you will receive additional information such as county of commitment, date of commitment, more sentencing information and victim information if applicable. 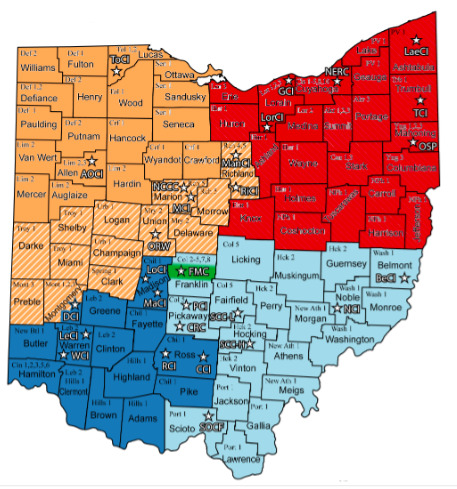 To find Ohio jail inmates, scroll down to the bottom of this page to see if your county is listed. (Not all counties have inmate search capabilities). If your county is listed, click the link and you will be guided to the search engine. The website of the Ohio Department of Rehabilitation and Correction has over 4000 pages. I have searched their website and selected the most important pages to answer the questions of family and friends of an Ohio inmate. You will find it all on one page on this link: Ohio Department of Correction Page. Click the headline above and you will be taken to the DOC website to see the list of names and numbers of those Ohio inmates now on death row. Male inmates are held at the Chillicothe Correctional Facility. Female inmates are held at the Ohio Reformatory for Women at Marysville. Links to Ohio jails will be added soon. I will be adding those jails that have online information concerning inmate searches, mail and visiting information as well as contact and other important information. If you are interested in more detailed information about each county such as their recidivism rates, commitment and release information as well as funding information click over to the County Snapshots page.